Observations: Ok. This is a long one but it needs to be! Please press on in it and go the whole page! This is where it gets nasty. Please understand I am not trying to glory the gory! My friends if we do not grasp the severity of what Jesus went through and suffered physically and spiritually, we’ll never fully grasp the abhorrence and utter depravity of our sins that eventually nailed God The Creator to a Cursed tree to die for His creation. THE TORTURE BEFORE THE CROSS [Dr Alexander Metherell M.D PH.D “Roman floggings were known to be terribly brutal. They usually consisted of thirty-nine lashes but frequently were a lot more than that, depending on the mood of the soldier applying the blows. The soldier would use a whip of braided leather thongs with metal balls woven into them. When the whip would strike the flesh, these balls would cause deep bruises or contusions, which would break open with further blows. And the whip had pieces of sharp bone as well, which would cut the flesh severely. “The back would be so shredded that part of the spine was sometimes exposed by the deep, deep cuts. Application: Isaiah 53:5 (NKJV) But He was wounded for our transgressions, He was bruised for our iniquities; The chastisement for our peace was upon Him, And by His stripes we are healed. 1 Peter 2:24-25 (NKJV) Who Himself bore our sins in His own body on the tree, that we, having died to sins, might live for righteousness—by whose stripes you were healed. For you were like sheep going astray, but have now returned to the Shepherd and Overseer of your souls. Psalm 129:3 Plowmen have plowed my back and made their furrows long. This prophetic description by Isaiah and the Psalmist of what the Messiah had to endure was written 750 years before the name Jesus was even known! The bible does not say you are going to be healed. It says; you were healed. It IS already done!!! The circumstances, diagnoses and doctors may say you are sick, but God’s word says you have already been healed!! 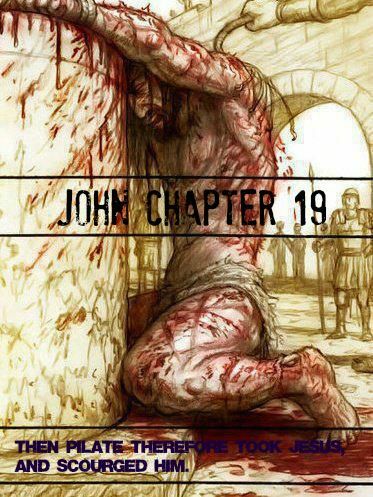 He came to set the captives free by being bruised, wounded, mocked, chastised, bled and died on that wooden cross for ALL the guilt, shame, depression, addictions, sickness, perversity and disease for ALL who claim Him as their Savior!! As true “Christians”, we have the choice of either claiming God’s Word, or claiming the diagnoses or circumstance causing the problem. We must truly understand and believe God’s word to claim it! So what does it really mean that “by His stripes we were healed? ”The Old Testament prophet declared, “The plowerman plowed upon my back: they made long their furrows.” (Psalms 129:3) Seven hundred and fifty years earlier, the psalmist had prophesied concerning the coming Messiah! “I gave my back to the smiter, and my cheeks to them that plucked off the hair: I hid not my face from shame and spitting. It has been said that Jesus went through 39 lashings on His back just for our healing. 39 stripes each represent a different major disease category. Insurance companies usually insure you for 36 major illnesses and as recently, the World Health Organization changed the ICD coding systems used to categorize disease and illness, from a list of 17 to 39 major categories!! How true these figures are I don’t know! However, why whip Jesus’ back for healing? It probably was 39 lashes, so maybe there’s a connection to the disease categories? Prayer: As you feel you ought or are lead to. This entry was posted in Jabez's Prayer and tagged Alexander Metherell M.D. PH.D., By his stripes we are healed, Calvary, Easter studies, Eusebius, Hypovolemic shock, Lee Strobel, The scourging. Bookmark the permalink.